I wasn't expecting much from the Sailor Jerry's National Rum Day celebration at Mother's Ruin. They weren't launching a new product, just promoting some punches for the back end of Summer, and having a nice get-together for a few of their closest friends. Norman "Sailor Jerry" Collins was a tattoo artist who served in the South Pacific before and during the second World War, where he developed his artistic style. He also played saxophone in various bands, hosted radio shows and gave lectures on tattoo art, and extended his tattoo brand into all kinds of ventures, most importantly (to us, anyway) to spiced rum. Rum was one of the earliest distilled spirits to be grown in North America, and in the 17th and 18th century was drank by rich and poor alike, not just pirates and hoodlums. But when prohibition hit, bootleggers turned primarily to whiskey and gin to keep underground America lubricated. Rum managed to thrive as a niche drink from the Caribbean, that had developed a foothold in Cuba and the Antilles, but it's taken much of the last 75 years to regain a serious foothold in American cocktail culture. That said, on to the cocktails themselves. My main use of Sailor Jerry is in Dark & Stormys, so while the rest of the world is used to citrusy rum concoctions, I was coming to this with a relatively clear palate. Two of the samples really stood out. The Rowes Wharf Punch refreshes on a hot day the way a good punch should. Combine everything except the ginger beer into a bowl, add ice and stir, then add the ginger beer. serve over ice. Once you have the ingredients assembled, you can make these all day & night. But the centerpiece of the evening was clearly the Wahine Pina Colada, a surprise to me as I have never been a big pina colada fan. Maybe people making them were trying to be too cute with the ingredients. This is a brute-force recipe that came out fantastic. Then again, I do love pineapple. Pour it into a hollowed-out pineapple, if you have one, and garnish it with coconut flakes, an orchid, or an umbrella, if you have them. A Wahine is a Hawaiian female goddess, though my first thought whenever I see the term is the first song in this montage. Happy National Rum Day, everyone. If you missed it, make it up this weekend. Stay cool. or, in my case, friends of friends. One of Sailor Jerry's proteges was a young Ed Hardy, who learned some of the master's lessons very well, though his vodka is a stylistic mess. To make the oleo syrup: Brew a strong cup of English tea, and (separately) muddle a grapefruit peel and a handful of blackberries into a cup of cane sugar. (You can swap out other rinds and berries if you have them, as long as you have both.) This is a useful fruity syrup that works in a lot of other cocktails. Liquor and fast women: what's not to love? 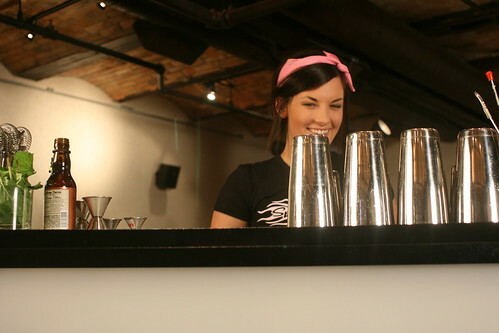 Then, two bartenders would set about furiously making all four drinks simultaneously (Ivy Mix told Inside F&B's Francine Cohen that "Speed Rack started as a joke I had with a bartender in San Francisco about getting women to double shake on camera") and, when finished, slap a buzzer which recorded their time. 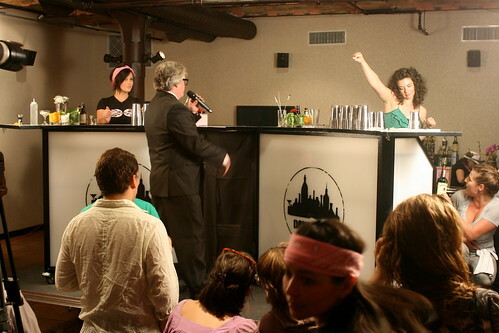 The drinks were delivered to the judges, and the judges then evaluated the finished cocktails for temperature, balance, adherence to the recipe, garnish, correct glassware, and all sorts of things, and their demerits would add to the bartenders' times. A winner was declared, and then it was on to the next pairings in a tournament-style bracket. The whole thing was a blast, with good music pumping, lots of cheering and energetic and light-hearted trash talk, and a convivial, friendly atmosphere. It was definitely an industry event, but lots of people who weren't in the industry were there and felt welcomed. A $10 donation got you in the door and as much punch (three different ones!) or gin & tonic as you wanted, and T-shirts, beer, and food (from Mayahuel, including a fantastic carnitas taco) were available for purchase as well. Another note: I think we've all been to poorly-organized events (fundraisers often seem to be the worst for this), where food and beverage run out, where there are ponderous delays in the entertainment, where sponsors weren't wrangled well, where decision-making was muddled and no one knew what came next. 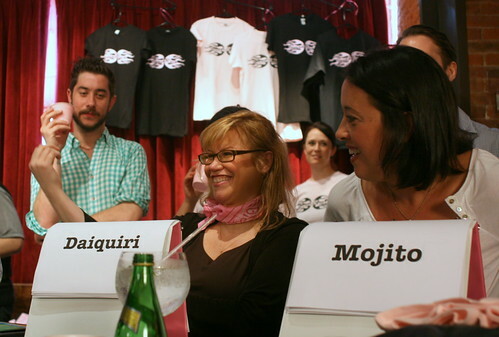 This event didn't suffer from any of that, and speaks to the organizational abilities of Mix and Marrero. 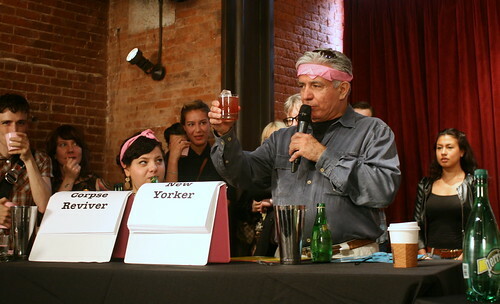 Yael Vengroff of Painkiller (ahem, PKNY) took top honors in the New York competition, and she'll face off against other regional winners at next year's Tales of the Cocktail. I've had excellent food at Green Goddess and the Acme Oyster House and Nola and the Old Coffee Pot so far. But how were the cocktails? My God, this place is amazing. Yesterday I had to pause and realize that I had to slow down and pace myself, because I was reaching the point where I had to pay attention to my consumption of free drinks or else lose my effectiveness for the day. It was 10am. After our wonderful dinner and drinks at Beaker & Flask, we headed back to downtown Portland, where I dropped off my (very understanding) girlfriend at Powell's Books while I headed around the corner to the Teardrop Lounge. This cocktailian temple is sleek and highly-designed, with a circular bar with a teardrop-shaped island (and suspended shelf above it, which seemed to function as something of an additional speed rail.) The place was pretty quiet when I was there, and the menu (I can't link to it here because of silly Flash design, but click to that main site, then "menus", then "cocktails") was fascinating. Rarely do I see a menu where I immediately want to try more than half of the drinks, and this one was full of really creative, interesting-sounding libations. I chose the "Impossible Dream", which apparently was the brain child of one David Shenaut and consists of Small's gin, Brew Dr. white rose kombucha, lime, the Rothman & Winter apricot liqueur, and gomme syrup. I couldn't picture it, and was especially curious about the presence of kombucha in the mix. Its fermented astringency worked really well well with the creamy-sweet liqueur, and the herbal gin brought it all together. Small's Gin is local to Portland, and is produced by Ransom, who also produced the Gewurztraminer grappa that David Shenaut had me taste at Beaker & Flask and which I enjoyed so much. (They also make a great and unusual Old Tom gim.) Small's is heavy on the cardamom in addition to the usual juniper and other botanicals. The Brew Dr. kombucha is also local to Portland. After just the one drink -- I really wanted to stay longer, but my time was running short -- I was happy to get a Twitter message from Blair Reynolds (aka Trader Tiki) letting me know he was behind the stick at Thatch in Northeast Portland. So off I zoomed to check it out. Thatch has an unassuming exterior set in a commercial strip, but feels like a tiki paradise once you're in; you cross a small footbridge over a rock-lined pool to get to the bar, which is liberally festooned with tiki decor and its namesake thatch. It was fun to meet Blair, whose enthusiasm and depth of knowledge fairly bubble out of him. At his suggestion -- since I'll be the first to admit that I don't know much about the Tiki kingdom -- he fixed me a Three Dots and a Dash, which was fantastically good: a little sweet, a a little tangy, a little spicy, and a little bit funky too. After shooting the breeze for a while, I decided to head back to Powell's to collect my girlfriend from the briar patch, since we had to fly home the next day. I said my goodbyes to Portland -- I greatly enjoyed my all-too-brief visit to this very livable city that boasts some excellent drinking opportunities. Can't wait to come back soon. After visiting Clear Creek Distillery, it was definitely time for an early dinner. We picked out Beaker & Flask from my Frommer's Portland guidebook, as it sounded like the food was good and the cocktail program was as well; after all, the name of the restaurant was certainly an encouraging sign. After a small bit of difficulty in finding the place (the guidebook has the address wrong, listing the side of the building around the corner from the restaurant entrance), we rolled up just before five. The hostess was kind enough to let us in before they'd technically opened (I'd say it's certainly in line with the ethos of hospitality to let one's prospective customers use the bathroom) and seated us right away. We were the first people in the joint, but it got busier pretty quickly. They even had stacks of interesting cocktail books scattered among the tables! So, for our first course of drinks I had to go for the happy-hour Between The Posts, consisting of Campari, fresh grapefruit juice, the Faygo Rock & Rye, and Peychaud's bitters. (My girlfriend had an excellent Dublin Dr. Pepper, poured from its glass bottle.) I was wondering if the drink would be too sweet (if my fuzzy memories of the stuff are correct, Faygo's sweet enough to dissolve a bulldozer), but it was wonderful and a great aperitif -- the citrus notes from the Campari and grapefruit (what a great combination), the bitter playing nicely with the sweet. I haven't mixed much with commercial sodas, apart from the odd Cuba Libre, and I really should start experimenting with this. Our meal was great, too -- we split the butter lettuce salad with a buttermilk-and-tarragon vinaigrette, and I had a pan-seared trout with spring veggies, smoked mussels, and sauce Gribiche. My entree was good, but my girlfriend's was great: a fork-tender grilled pork tenderloin with English pea arancini, pea greens, and pistou. With our entrees, I chose a Stuck in Lodi (rye, Gewurztraminer syrup, Cynar and Peychaud's bitters) for my second cocktail. I was curious about all the various flavors in this one, and there were a lot of moving parts -- possibly too many. The drink was definitely rich and complex, but I kept wanting to take smaller and smaller sips because it was a bit of a sensory assault. I recently returned from an all-too-brief sojourn to Portland, Oregon. Aside from enjoying a beautiful setting, nearby mountains, lush greenery, and workable public transit, the denizens of Portland seem to pay exceptionally close attention to what they put in their mouths. We had some stunningly good coffee (double macchiato for me, cold-brewed iced coffee for my special lady friend -- both were fantastic and rich, and we're greatly enjoying the Burundi Bwayi beans we brought home) at Stumptown's downtown location (with a comically-hip magazine selection), some good microbrewed beer (Hogsback Oatmeal Stout at the Mt. Hood Brewing Company's Ice Axe Grill in Government Camp, LTD 02 at Full Sail in Hood River, and Golden Ale at the Lucky Lab in Portland), and even some wine. But all of that, no matter how good it was, is well outside the mission statement of this here site. I am pleased to report that Portland treated us very, very well on the cocktail and spirits fronts. The first place I decided to check out was Clyde Common, run by the estimable Jeffrey Morgenthaler. (Jeffrey wasn't there at the time -- the guy unaccountably seems to get some days off once in a while -- but Shannon cut through the happy-hour crowd of braying hipsters and took good care of us.) The cocktail list there was fascinating and complex, and I wanted to try everything on the menu. We limited ourselves to one each, though, as we had other commitments later on. My girlfriend chose the One-Trick Pony (Pelinkovac bitter, Maraschino, house-made tonic, lime), which was very good. I hadn't heard of Pelinkovac before -- from what I could taste in this drink, it was reminiscent somewhat of fellow Eastern-European bitter Unicum -- but the idea of mixing a digestive bitter with Maraschino liqueur and bitter-ish tonic sounded yummy. The liqueur and tonic balanced out the herbal bitterness nicely, and it went smoothly down the hatch. After six weeks in the bourbon barrel, our Negroni emerged a rare beauty. The sweet vermouth so slightly oxidized, the color paler and rosier than the original, the mid-palate softly mingled with whiskey, the finish long and lingering with oak tannins. I also thought it smoothed out the bitter spikes that can come from the Campari, and basically mellowed the whole thing. The whiskey barrels gave it an oomphier flavor that melded well with the vermouth's spiciness, and added a complex richness to the drink. This was a great before-dinner drink that almost made me want to skip the dinner.